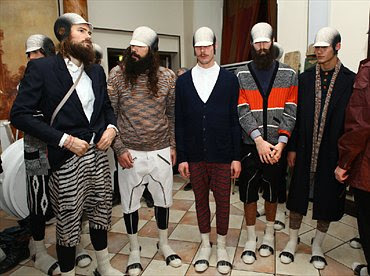 Danish designer Henrik Vibskov will soon celebrate his 10th anniversary of Parisian runways. This collection, despite its typical theatrical, multi-media setting, was surprisingly wearable: a controlled colour palette of blues, earth tones and occasional red or yellow splashes. Belted knitwear, harem-inspired slacker pants and plenty of suits brought a whiff of gentleman-ness to the hairy sock shoes and 1920s felt hats that appeared on each outfit. As for the recurring small handbags and nightgowns worn on top of trousers, they contributed to the designer’s timelessly cuckoo charm. Dazed Digital: What story are you telling? Henrik Vibskov: Seven years ago I created an instrument, and I thought I should do it again. It’s kind of a Henrik instrument: all the models are generating a sound, an analogue sound, an acoustic sound and a sample sound, so they can actually create a chaos, for a massive and spectacular result. DD: Do you sense of stylistic evolution? Henrik Vibskov: Kind of. I’d done a lot with glasses in the past, you know, small, funny glasses, so I thought that’s something I shouldn’t do this time. Instead, we worked with hats to cover the eyes; we used a lot of energy to create that identity and in three-week time when we do the show in Copenhagen, the female connection will also come in and make it even stronger. DD: What’s the connection between today and the next female collection? Henrik Vibskov: The two are always part of one story – this time, it’ll be like a small society, a little group where the men and the women all come from, a group of weirdo straw people; there’s less makeup overall. All the men have beards. Pretty hot, no?